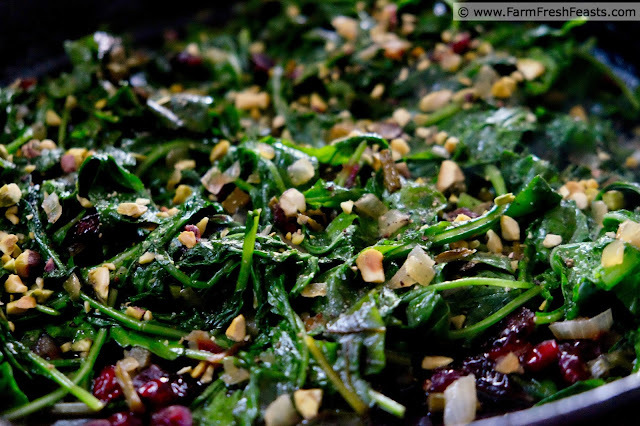 Brightly colored and fresh tasting, this side dish of sautéed cooking greens with dried cranberries and crunchy pistachios is sure to satisfy. Great alongside roasted meats or mashed potatoes! "The flavor of fresh foods is amazing"
"I never knew I liked _________ (insert a new-to-them vegetable here like kohlrabi or beets)"
"I'm not used to eating all these greens." It's this last comment I want to address today. I'm finding that my family is more likely to eat greens if I keep throwing greens at them. Not literally, though. If I literally throw greens at people, Robert Barker happily eats whatever lands on the floor. Simon flees from the leaves in terror, and Vincent grabs one, refuses to eat it, but will defend--to the pain--his right to keep it in his bed. Anyway, I serve a lot of greens during the cool weather crop season. 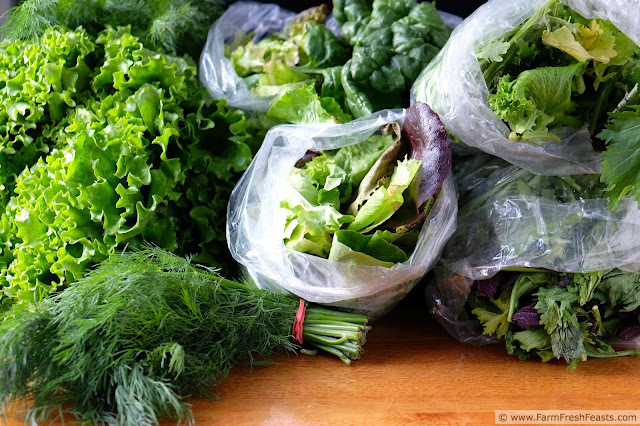 Salads (chopped, rinsed, spun and packed into wide mouth jars for easy access) appear alongside most entrees when we've got salad mix of lettuces in the farm share box. Stir fries (like my Colorful Chard and Chicken Stir Fry or my Orange Teriyaki Slaw Stir Fry) or smoothies (like my Peanut Butter, Spinach and Banana Smoothie or my Kale, Date, Banana, and Peanut Butter Smoothie) appear if there are members of the beet and cabbage families in the share. When my family tires of our basic salad I can always change it up with new dressings or different combinations of fruit, like my Black Raspberry, Pistachio, and Goat Cheese Salad, or different combinations of raw and cooked vegetables like in my Farm Share Chopped Salad. The possibilities are wide open. We can do the same thing with cooking greens. 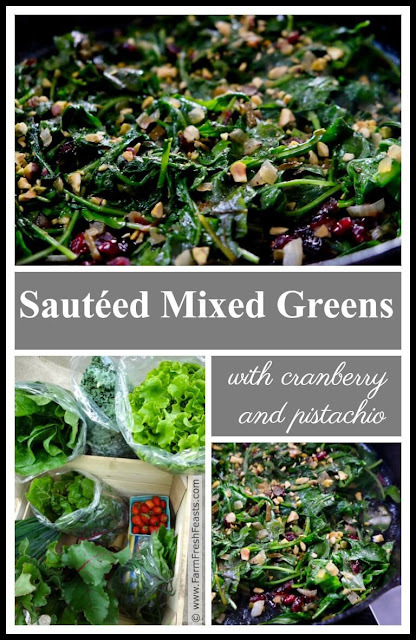 Here's an idea for a side dish that uses a cooking greens mix. It was nice alongside roast pork and would be a good side dish at Thanksgiving, too. For more recipes using cooking greens, please see my Recipes for Cooking Greens Collection. It's part of the Visual Recipe Index by Ingredient, a resource for folks like me eating from the farm share, the farmer's market, the garden, the neighbor's garden, and great deals on ugly produce at the grocery store. Note: any combination of tender cooking greens like spinach, kale, cabbage, turnip greens, collard greens, beet greens, bok choy, or mustard greens would work in this recipe. Preheat a large skillet with a lid over medium high heat. Add butter or oil. When the fat is shimmering, add onion and sauté until starting to soften. Add chopped greens and stir to coat with fat. Add broth, cover, and let steam/wilt for 3 to 5 minutes. Stir in salt, pepper, and cranberries. Cook a few more minutes until warmed through. Sprinkle pistachios on top, and add a splash of vinegar if you like. Serve. 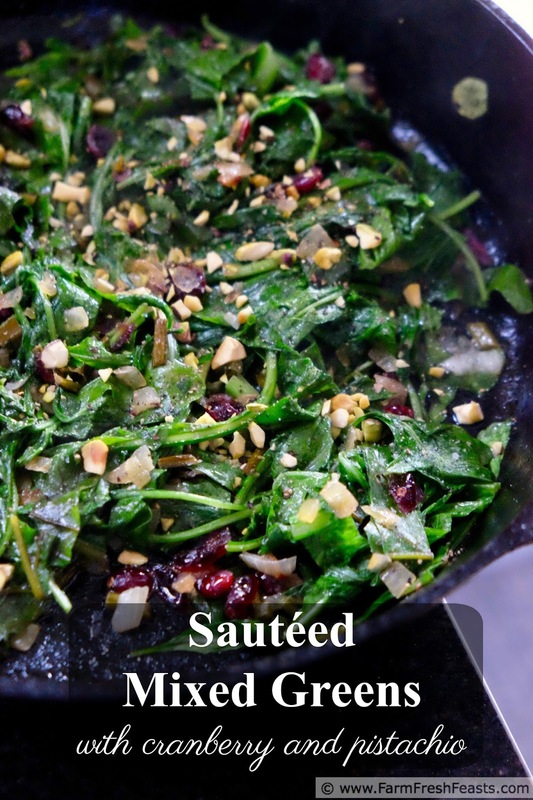 The cranberries and pistachios make a really nice addition to the sauteed greens. I can just imagine the sweetness and the crunch they lend to the dish. Next batch, I'll give this a try.